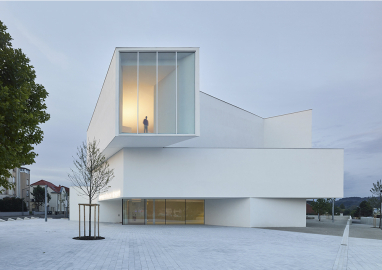 Northeast of France, in struggling former coal mining town Freyming-Merlebach, a bright new theatre sets a strong dialogue with the heterogeneous cityscape. Its unusual figure and dimensions create a streamlined silhouette whose lines ensure visual transition between the various parts of the programme while keeping on the same scale as the town. The main facade, forecourt side. Disused mining tunnels made subsoils unstable and led the historic theatre to deteriorate, but Freyming-Merlebach’s municipal authorities saw culture as one possibility for resolving the socio-economic difficulties of postindustrial transition. 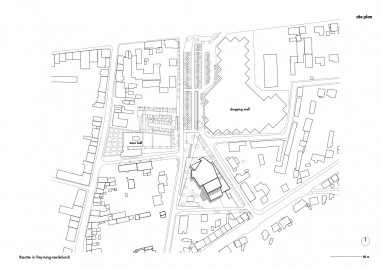 The ‘Théodore Gouvy’ theatre generates a new public space in the town centre. 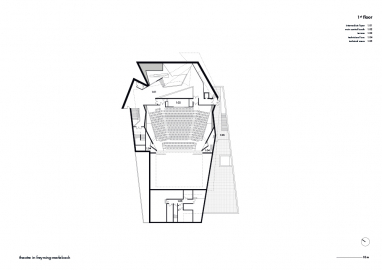 A 700-seat auditorium (balcony: 223, stalls: 477) with dedicated areas for performers and logistics hosts every area of live performance: classical theatre (including large-scale sets), contemporary theatre, musical theatre, opera, dance, etc. The white envelope twinkles in the mining town’s landscape. 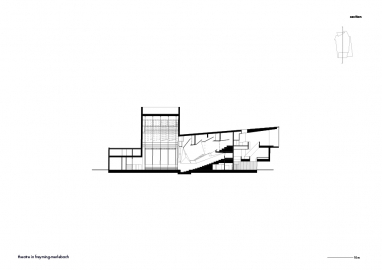 The visitor’s interest is caught by the animation of the volumes: in the upper part, the foyer is offset to indicate the entrance, while in the lower part, transparent elements allow glimpses of the wealth of interior routes and invite one to enter. In an evolving sector close to the new town hall and a declining shopping centre, the theatre is a symbol of the town’s renewal. The building stands out through strong plasticity, height and volumes. Looking at the town, it stands on a base along the municipal offices. Its unusual figure comes from a decision to absorb the volume of the stage equipment in a gradual reading. The mass progressively erodes all the way to the forecourt of white marble cobblestones. A rather modest entrance on the side allows to present the hall in its greatest length. The foyer occupies a vertical space through a spectacular route of intertwining staircases leading to the auditorium. Natural light floods the circulations and varies with the day in an evolutive spatial staging that echoes the very image of theatre. 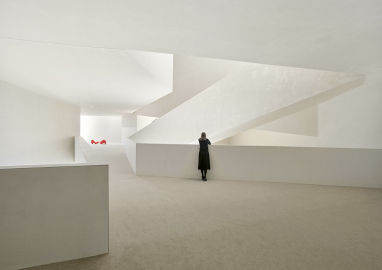 Oblique lines reiterate the site’s complex geometry, volumes expand with a feeling of space. A scenario of unveiling unfolds from the immaculate facade to the many-nuanced foyers, till the deliberate rupture of the auditorium. Red, pink and orange lend density to this central space. The most distant spectator is 20 metres from the stage: a proximity enjoyed by audience and performers. 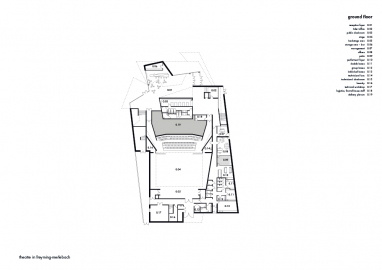 Stagecraft properties are exceptional: a 24-metre-high stage house with a grid at a 17 metres height and upper grid at 19.5 metres, a catwalk and two bridges, arranged around a stage of 22 by 14 metres with a proscenium of 14 by 9 metres. 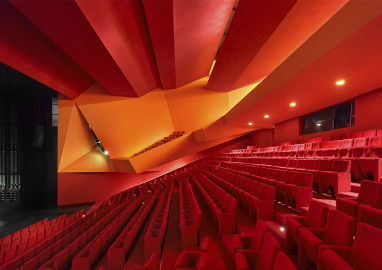 For acoustic and thermal reasons, the auditorium's structure is made of cast-in-place concrete. Hall and circulations have a less expensive steel structure which allowed to respect the initial budget of the competition. Untreated plaster in which one can feel the hand of the craftsmen and beige carpet on the floors bring pleasing acoustic and soft, homogeneous textures that strengthen the enveloping feeling of a fragmented cocoon. External insulation provides thermal inertia and real comfort during summer without air conditioning. The building has French High Environmental Quality (HQE) label.